Cowra Antique Vehicle Club Inc. 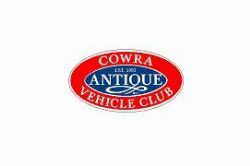 The Cowra Antique Vehicle Club Inc. was initially started by Phil Hoey in 1993 to cater for vintage car owners in the Cowra district. At that time a number of enthusiasts belonged to a club in Young but Phil wanted a local club and the rest is history. The membership is not restricted to Cowra and the club boasts members from Canowindra, Orange and Bathurst. The club is the friendliest, best club in the central west according to it's members. It currently has ninety members and amongst the membership are one hundred and fourteen vehicles on club plates. The range of vehicles covers motor bikes, cars, trucks and tractors and the club caters for all tastes. 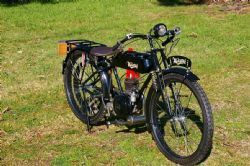 The oldest motorcycle in the club is a 1924 Waratah, the oldest car is currently a 1924 Dodge and the newest vehicle is a 1980 Mercedes 280SL. 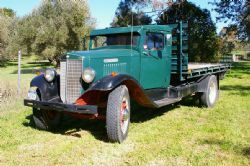 The Cowra Antique Vehicle Club has a few unique attributes. Firstly, it has it's own club room. The building is the Cowra Railway Station where they run meetings every third Monday evening with roughly forty to fifty members in attendance. The club room is adorned with pictures of members vehicles and another element that makes this club unique is the amount of club runs allowing members to get out on the road and drive their vehicles. They organise approximately seventy runs each year and have runs on most weekends. They supported the National Heritage Day every year and had a lot of the members vehicles parked in town and the positive feedback from the locals will see ongoing support for this event in the future. It is a very relaxed club and they endeavour to make it as simple as possible to clock up runs and enjoy the club. Annual membership fees are a miniscule twenty five dollars and it is compulsory to partake in at least three runs a year. For your membership investment you receive twelve club publications that average sixteen pages each that keep you informed of the clubs activities. Aside from the social aspect of the club you can attend and vote at the AGM held each year in May to elect the committee. 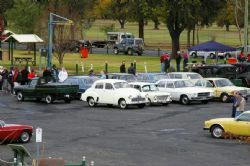 To simplify matters even more the Cowra Antique Vehicle Club has an annual registration day normally around the 18th August each year with five scrutineers to check over each vehicle to ensure road worthiness. The club submits the necessary paperwork to the RTA and all the historic plate registered vehicles are renewed for the beginning of September. If you live in the central west and are interested in joining a club catering for a wide range of vehicles with a friendly social outlook you can call Russell Denning on 02 6342 3117.